In the heart of Cesenatico, the Rosso Blu Hotel is a 3-star hotel with private parking, free bicycles, Wi-Fi connection and a rich program of excursions. Small pets allowed with supplement. 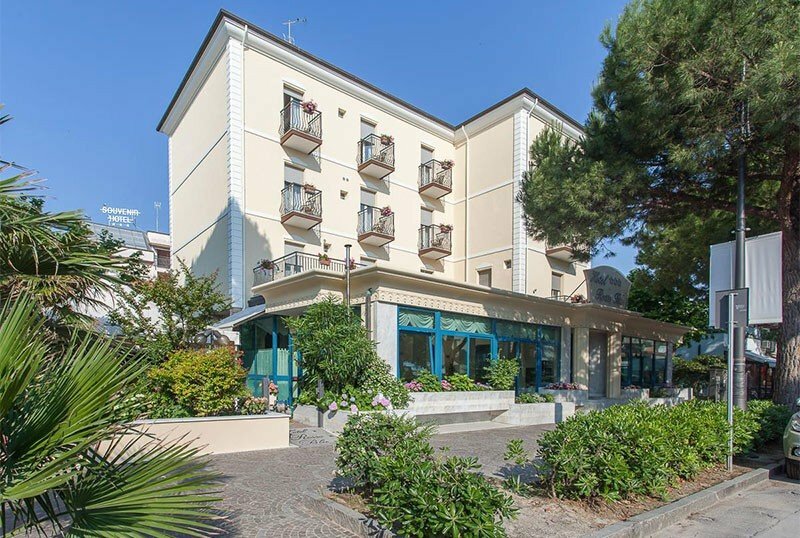 The hotel is located in Cesenatico, in a quiet location but close to the sea and the historic city center: the beach is a couple of minutes walk away, as is the canal port. All rooms have a balcony and private bathroom with hairdryer, digital terrestrial TV, independent air conditioning, WI-FI, safe and telephone. Frigobar and sea view for a fee. STANDARD: simply furnished and available with sea view (with supplement). DELUXE: elegant and with renewed furnishings. FAMILY STANDARD: consisting of two connecting rooms, one double and one with bunk beds, and a bathroom. FAMILY COMFORT: consisting of two connecting rooms with modern furnishings. Garden, open-air porch, free bicycles, elevator, safe deposit box, reading room, room with satellite TV, meeting room, newspapers, laundry service (on payment). Equipped for cyclists, theme nights are organized. PARKING: uncovered and free to limited places. CONVENTIONS: beach, swimming pool, waterslide, amusement parks, organized excursions. PETS: small pets allowed with supplement for room sanitation. BREAKFAST: international buffet breakfast with homemade cakes and pies, yogurt, cereals, fruit, cold cuts, cheeses, hot and cold drinks. LUNCH AND DINNER: 3-choice menu with vegetable buffet and dessert. Pasta and desserts are homemade. VARIATIONS: vegetarian and gluten-free cuisine. In the hotel: outdoor playground area, babysitting service for a fee. At meals: baby food , bottle warmer, high chairs. The hotel has an agreement with the Bagno Romeo. Among the services available: entertainment for children, playground area, sports fields, cabins. - Upon confirmation, a deposit of € 200.00 per room is required. - In case of cancellation the deposit will not be reimbursed. FAMILY PLAN: 2 adults + 2 children (0-6 years) = 3! The Granfondo is the most important cycling event and for those who want to participate, you can't miss this fantastic offer! Relax at Easter with your whole family at the Hotel Rosso Blu! Advantageous packages and more, you spend less! The granfondo is the most important cycling event and for those who want to participate, you can not miss this fantastic offer! FINALLY SUMMER ... JUNE: SUN, SEA, RELAXATION AND RED BLUE HOTEL! Stay at least 7 nights in June at Hotel Rosso Blu, many services for you and all the comforts you want! Finally the sun, the sea and the summer! Your holiday at 2 steps from the sea at the Hotel Rosso Blu! Offer valid from July 14th to August 4th in All Inclusive for only € 77 per person per day. September from 1 to 8 unmissable offer for you and your family! Come and discover Cesenatico, the theme parks, the hinterland and the calm sea.